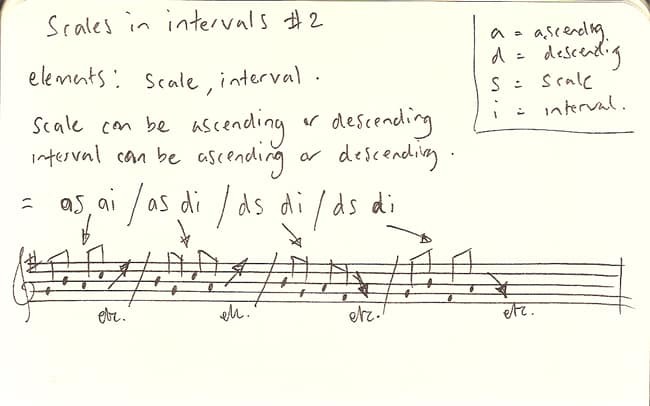 Looking at the last exercise with thirds, you can be ascending or descending through the scale, and the interval can be ascending or descending. That gives us four things to do to. You might think beyond pairs of intervals, too. A group of three intervals might be arranged – ai ai di, repeating as you go up the scale. So, many more possibilities there. I think the point of these kinds of exercises are to do enough of them to feel confident that you’re able to play any permutation you imagine, even though you may not have done it before. Once you get there, you can stop doing exercises :) But until then, crack on!